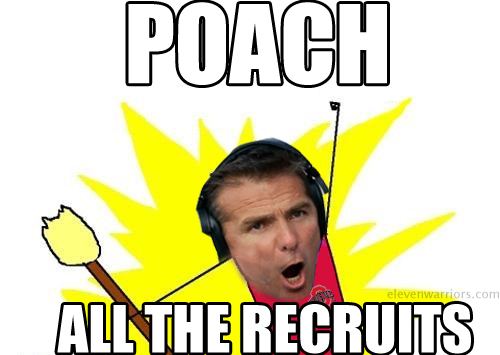 The Urban Meyer recruiting process explained. "Sorry, Penn State. We know you've had a tough week and all but, um, we got you this 24 point loss. We forgot to get a gift receipt. Sorry about that." With the tyrannous empire of northern ill contempt looming on the horizon, Aaron Craft seems finally to be returning to form and who knows, maybe we could soon be watching a renaissance of The WB. Alas, that's not why many of you are here. That's not why even those amongst us (present company included) that don't eat, sleep, and breathe recruiting have a purpose for the next week. National Signing day looms ominously with but a week to go for Urban Meyer to continue to make head coaches around the country both lose sleep and require weekly consultations with Dr. Paul Weston. In order to get the straight dope and get you covered on all things recruiting, we welcome back 11W's Senior Editor and Director of Scouting/Recruiting, Alex Gleitman. While we certainly care about the future of the program and love to celebrate little victories as much as the next, Johnny nor myself are anything close to what you could call recruiting experts. After having taped this edition of the podcast, both of us were infinitely better for it. You will be too for having listened. 0:37 - We rehash the Penn State game. It was such a thorough de-pants-ing, that well, it was kind of boring at times. That's still awesome sometime. We explain what the keys were, why Jared Sullinger is sometimes being forgotten/under appreciated, and also look briefly back at the cornpocalypse that was this past Saturday's game with Bill Nebrasky (roughly around the 4:18 mark). We also look ahead to the Michigan affair that will be anything but casual nor cordial. 8:13 - What did Urban Meyer's transition into the OSU recruiting sphere look like? Were there any trepidations about guys already locked up by Fickell, et al.? Did Meyer seriously consider pulling any scholarship offers or are any guys still on the fringe at all? 9:42 - What's the health of the Glenville pipeline post-Jim Tressel? Does Meyer have any new pipelines/relationships with power programs in the state on the horizon? 11:41 - A meta overview of Meyer's recruiting strategy as a whole, including how it compares to Tressel/Fickell before him and just what exactly a 'committable offer' is now that Urban Meyer's administration is in full gear. 13:50 - Who are some of the big names still on the horizon that could be added to this 2012 recruiting class? Alex also mentions an interview soon to hit 11W you won't want to miss. 18:10 - Which of the guys in this class could be the best of the bunch, regardless of what some of the traditional authorities think? 20:24 - Just how well will the entirety of the class fit into Urban Meyer's system? 21:38 - And can any of these guys be immediate difference makers and see the field in year one? 23:49 - Our wildly popular-ish, new-ish segment "Ask Us Anything" returns with four questions from actual commenters/readers. We cover everything from how the recruiting numbers add up to whether one has to have attended the university to be able to claim "true Buckeye fandom". You won't want to miss this. If you have any questions, OSU related or just hilarious real life queries apropos of nothing, shoot us an e-mail. You could find your question read allowed and answered on air. Our intro music today comes courtesy of White Rabbits' new single from their forthcoming album, "Milk Famous", titled "Heavy Metal". It's not available for purchase, but you can get it free courtesy of the band (don't say we never gave you anything). The post-guest transitional piece is The Men's next single, "Open Your Heart", from an also yet to be released record. The final number is the new tune from another unreleased record (notice a trend here?) by Grizzly Bear's Daniel Rossen, titled "Saint Nothing". Neither of those two are purchasable yet, however, you can probably find them easily digestible (and probably free) by doing a simple Google search. If you'd still like to help the site, I'd encourage this week, in lieu of buying some great mp3s, to donate using the button in the upper right hand corner. If you enjoyed the podcast, tip us just a couple of bucks, and when the site has a full-time beat writer, the kind of info we'll have will be even better.